The BMW 5 Series was the first model to introduce the controversial ‘flame’ design which split opinion. However we’ve always been fans so we were keen to see if the latest design would also hit the spot. We think that BMW has got it right again with a dynamic and thoroughly contemporary design which keeps the 5 bang up to date. The new 5 Series comes with an array of EfficientDynamics technologies. All manual gearboxes come with an optimum gearshift indicator to help drivers know when to change gear to optimise the car’s efficiency. Brake energy regeneration, which recharges the vehicle’s battery during engine over-run, is part of the 5 Series Saloon’s standard specification. This combination of technology allows the 520i to achieve an impressive combination of pace and efficiency. With 182 bhp on offer and a very healthy 214 lb ft of torque available from just 1,350 rpm, it makes light work of its 1605 Kg kerb weight. In the driving stakes BMW has kept the trademark 50:50 weight distribution so we expect it to live up to the ‘ultimate driving machine’ tag when it’s launched. There is also no reason to expect anything other than the excellent build quality that we’ve become used to. 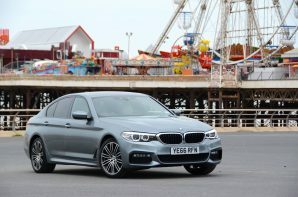 The BMW 5 Series has always been the most engaging executive saloon to drive and the latest version maintains top spot. The 520i blends performance with strong fuel economy and poise making it the ideal choice for enthusiastic drivers.